Quality of care fluctuates wildly. Some countries, like Sri Lanka, have made major improvements while others, like Afghanistan and Pakistan, still struggle to meet baseline needs, said Dr. Linda Bartlett, an associate scientist at Johns Hopkins University’s Bloomberg School of Public Health. There are major disparities within countries as well, noted Dr. Pallavi Gupta, health program coordinator of Oxfam India. “Even in southern states [of India] that are advanced, you have pockets that are extremely backwards,” she said. In Pakistan, the overall maternal mortality rate is 276 per 100,000 live births, but in the province of Balochistan the rate is as high as 785, with less than 10 percent of pregnant women receiving adequate vaccines and immunizations. “It seems horrifying that a country with nuclear capability can only vaccinate less than 10 percent of pregnant women in a whole big region of their country,” Bartlett said. Bartlett, Gupta, and other panelists at the Wilson Center on March 31 were participants in a February conference on the state of maternal health in South Asia sponsored by Oxfam India. Delegates from each South Asian country convened in Nepal for discussions on recurring problems, highlighting four persistent challenges as well as recommendations for improving results. Even when concrete and useful numbers are produced, they are often inaccessible or incomprehensible to the communities that need them most, and aggregation can cover up marginalized groups who are consistently left out of overall gains. And surveyors largely ignore qualitative data regarding user experience, which Gupta believes is critical to successful health programs. To close the data gap, the panel called for a more robust collection process led by surveyors who better understand the issues they are dealing with. “Frontline health workers who provide data should be trained to look at the perspective of service improvement, not just asked to fill in a data collection sheet,” Gupta said. She also suggested limiting surveys by external groups to reinforce in-country capacity and encouraging more collaboration between existing efforts by NGOs and funding agencies. When possible, data should be disaggregated too by religion, caste, ethnicity, and education, she said, to help discern which communities are in most need of programs and care. While data plays a critical role, Bartlett pointed out that maternal health is inherently a human rights issue. Providing care with dignity, informed consent, and open communication about options may be difficult to measure, but plays a major role in whether women take advantage of health care when it’s available. “It only takes one bad experience in a labor or delivery room to make you very aware of it,” she said. Instances of obstructive violence, corruption, violations of patients’ rights, and disrespect and abuse in the labor room are not uncommon. Patriarchal societies, and religious and ethnic differences often cause systematic discrimination, said Bartlett. She recommended it become mandatory for health workers – from physicians to midwives to those who operate the front door – to take basic training on respectful care. She also suggested using local celebrities to bring attention within the broader context of violence against women, noting that celebrity status can spread messages wider and faster among the South Asian diaspora than it might elsewhere in the world. Where mortality measures the instances of maternal death in a country, morbidity looks at the general health and wellbeing of women. For every woman who dies from pregnancy-related causes, between 20 and 30 are left with acute or chronic health conditions, yet “there is no South Asian country besides Sri Lanka that tracks morbidity data,” said Dr. Jahangir Hossain, program director for health at CARE Bangladesh. Reducing morbidity will require a better trained workforce. In Bangladesh, Hossain said CARE has been helping to create innovative public-private partnerships that bring more skilled workers to communities in need. By December of 2014, 34 percent of babies in the region were delivered by the new, privately trained providers while only 15 percent were delivered by providers who had been in place before. The privately trained providers were also earning ample wages and showing signs of financial stability. The program’s results showed that private providers can complement public efforts and fill in gaps in areas where the public health system is not functioning adequately. Stilwell has evaluated how people enter and exit the health work force, looking for the best ways to improve quality and retention in poor resource settings. She cites a lack of secondary school, particularly for women, as an issue in low- and middle-income countries that prevent workers from qualifying for advanced degrees. People may also be driven away from education because of costs or, if they have the money, migrate abroad to practice instead of staying in the country where they were trained. Connecting health care to a “bigger picture” purpose can give health workers incentive and motivation, Stilwell said, especially when they see data that says quality of care makes a difference in their patients’ lives. Allowing people to master their professions gives them a career ladder and an opportunity to advance their work. According to the 2014 State of the World’s Midwifery Report, midwives could deliver 87 percent of all essential and needed care to mothers and newborns worldwide if given the right training. Sources: Institute for Health Metrics and Evaluation, UN Population Fund, World Health Organization. 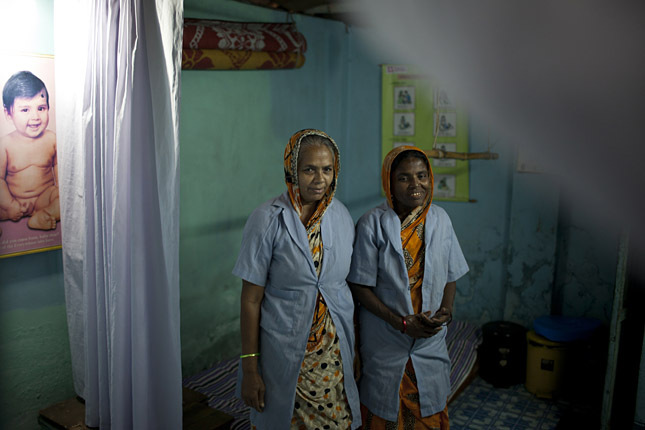 Photo Credit: Midwives wait inside the birthing center in Dhaka, Bangladesh, courtesy of Conor Ashleigh/Australian Department of Foreign Affairs and Trade.